Little known Hawkers Cove offers a tidal stretch of white sand and awe inspiring sea and sky panoramas of estuary and coastline. Hawkers offers a quiet alternative to the busy streets of Padstow, only a short distance away. 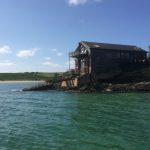 See our choice of Hawkers Cove cottages. Book a cottage in Hawkers Cove for your holiday on the water’s edge. This is a wonderful, sheltered cove just a mile from Padstow along the coast path. There are just a few houses here in this remote location at the sea’s edge. Here you can watch boats pass as you look out over the Camel towards Daymer Bay and Polzeath. The sandy beach at Hawkers Cove is popular with families thanks to the sheltered flat water of the tidal estuary. It’s also popular with kite surfers and windsurfers when the wind is blowing from the northerly direction. 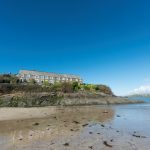 Hawkers Cove is a fantastic location for a Cornish holiday.